Adventure of the Seas Discounts: Cruises from $362 with a Best Price Guarantee. Located on Deck 4, classic five star dining at Chops Grille on Adventure of the Seas awaits you. Perfect for special occasions, your wine list at Chops Grille is the best to be found on your cruise! Tuna Tartarre and crab cakes are among appetizers, and your main entree choices include Filet Mignon, a variety of cuts of steak, lamb chops, prime rib, and fish. This restaurant receives excellent guest reviews for staff service and delicious food. Desserts on your menu include the Mississippi Mud Pie and Apple Pudding. Chops Grille is one of the most popular restaurants on the Adventure of the Seas. Reservations are required. It is advised that you book early as the Chops Grille will sell out. You can make reservations as soon as you board the ship, however, the best way is to make them is during online check-in well before you get on board the ship. There is a charge per diner to dine at Chops Grille. The charge is $39 USD per diner. Zuppa, Antipasti per Due, Focaccia al la Giovanni, pastas, ravioli, pepper crusted tuna, chicken breasts, and veal main entrees and desserts such as mascarpone mousse and cannoli are sample menu items at Giovanni's Table on the Adventure of the Seas. Lunch is 15 USD and dinner is 25 USD per person at Giovanni's Table. Smart casual attire is recommended. Giovanni's Table receives good reviews for food quality and staff service. This restaurant is aft of Chop's Grille on Deck 11. Enjoy your five course epicurean dining experience at the elegant yet cozy Chef's Table. Following champagne, the sommelier pairs each delightful entree with the perfect wine. This venue does require formal attire, and we recommend more time than typical for this classic gourmet repast! The Chef's Table starts at 95 USD per person. On the a la carte menu at Izumi Japanese Restaurant on the Adventure of the Seas you will find signature rolls, you'll find Snow Crab California, Box salmon & Crab, Box Yellowtail Tuna, Shrimp Tempura, and Champagne Salmon. Food and beverages are at current menu prices. We suggest smart casual attire, and that you check when on board the Adventure of the Seas for operating hours of Izumi. Izumi is located on Deck 5. Tank tops and bare feet are not permitted. Chops Grille is available for dinner by reservation only. We recommend making your pre-confirmation reservations online (during the check-in process) or with Royal Caribbean's Ship Services as soon as possible after booking. You may make your reservations the first day of your cruise, but with this option your choices will probably be limited. Royal Caribbean offers special reservations packages before you board, which include booking reservations for Chops Grille. Chops Grille is a dinner only experience from 6:00pm to 10:00pm. You'll feel most comfortable at the supper club in elegant attire on formal evenings, but otherwise smart casual is suggested. There is no smoking in Chops Grille. The 39 USD fee per diner does include gratuity at Chops Grille and specialty drinks, beer, wine, and soft drinks can be purchased from the current bar menu. How much should I tip at Chops Grille on the Adventure of the Seas? First, bear in mind that all alcoholic beverages that you pay for will have a gratuity added. The cover charge does include gratuity, however, you may wish to consider giving an extra gratuity to the waiter or waitress who has served you. An appropriate amount is to estimate the value of the meal you ordered if you ordered it on land and tip 15-20% based on that cost. If you feel that the value of the meal was $50 were you to order it in a land-based restaurant, you should tip $7.50-$10. 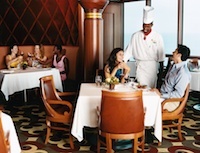 It is certainly your discretion not to tip, but, the waiters serving you are some of the best on the ship and should be rewarded if they provided you with an exceptional dining experience. We will e-mail when there is a change in price on this Adventure of the Seas cruise. You can unsubscribe at any time. Adventure of the Seas cruises from $362The latest deals and best discounts on all sailings. Take The TourThe Adventure of the Seas Tour saves you time and money. Photos & VideosExclusive video tours and photo galleries of the Adventure of the Seas. Best Cabins AdvisorExperts help you discover the best (and not so good) cabins on Adventure of the Seas. Cabin Category GuideAdventure of the Seas cabin category differences explained in plain english.